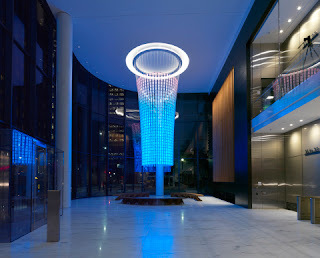 BusinessWire 09 October 2015: Created by pioneering experience design firm ESI Design for The PNC Financial Services Group, The Beacon, a first-of-its-kind, data-driven media installation located in The Tower at PNC Plaza, pulses with shifting light, color, and sound patterns to express energy and water consumption, water recycling, sun exposure, natural ventilation, waste, composting, use of artificial light, and other building indicators. Believed to be the world’s greenest skyrise, the new corporate headquarters incorporates ground-breaking green technology and design strategies, which led to LEED Platinum certification, the U.S. Green Building Council's highest rating. 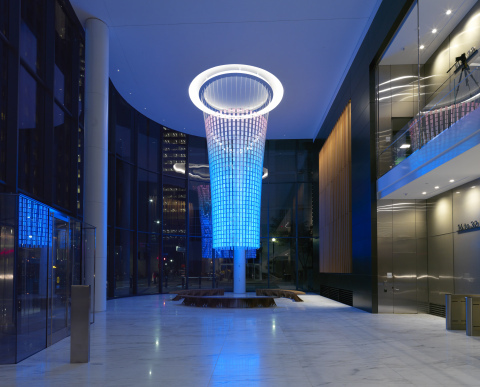 The Beacon, a soaring, 24-foot-high installation, comprised of 1,584 transparent liquid crystal polycarbonate panels backed with...read on.